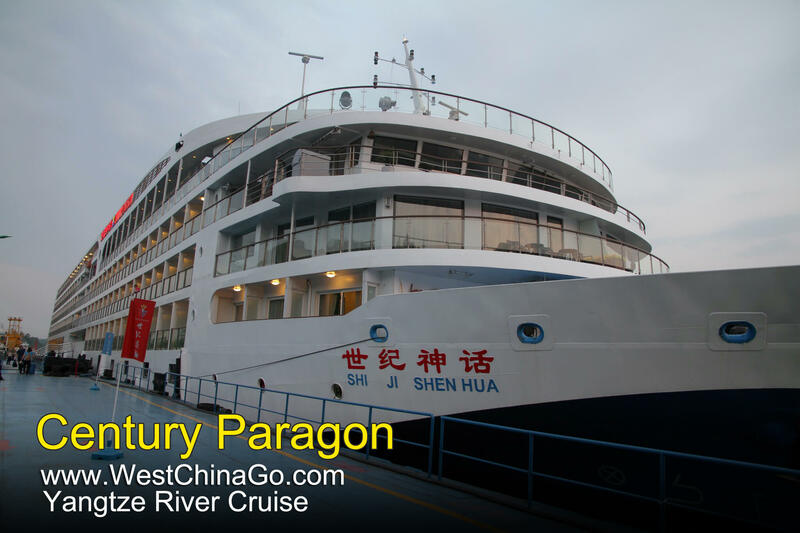 Designed and operated specifically for Western passengers, Century Paragon is owned by Century Cruises, which has a fleet of seven modern vessels on China’s Yangtze River. Launched in 2013 with sister vessel Century Legend, the sibling ships are the newest in the fleet and two of the most luxurious on the Yangtze. Built in the Chongqing Donggang shipyard, Century Paragon was designed by Yran & Storbraaten, the Norwegian naval architectural firm that has worked with lines including Seabourn, Disney Cruises, Holland America and Viking. The ships are often chartered by major river cruise lines such as Uniworld and Avalon and tour operators like Wendy Wu. Much larger than the river ships on European rivers, which are restricted in size by low bridges and the size of locks, Century Paragon has more cabins, public areas and additional amenities. Features include a large swimming pool and cabins on the sun deck, a rarity on river vessels. The 196 cabins are spread over six of the seven passenger decks and comprise 156 Deluxe cabins (301 square feet), 34 Executive Suites (415) square feet), four Junior Suites (323 square feet), and two Presidential Suites (1,140 square feet). All cabins have floor-to-ceiling sliding-glass doors that open onto a private balcony, with the exception of the eight Deluxe cabins on the lower Main Deck (Deck 2), which have large panoramic windows that do not open. There are 32 Deluxe cabins on the Upper Deck (Deck 3), and the most cabins — 66 in total — are on the Promenade Deck (Deck 4), comprising Deluxe, Junior Suites and the two Presidential Suites, situated forward with wraparound balconies, a table, two chairs and two loungers. The Bridge Deck (Deck 5) has 64 cabins, made up of 62 Deluxe and two Junior Suites, and there are 23 Executive Suites on the Observation Deck (Deck 6). The 11 other Executive Suites are on the Sun Deck (Deck 7). All cabins have a bathtub and shower. Standard cabin amenities include a sofa, coffee table, desk, hair dryer, quality cotton bed linen and memory foam bed topper, high-definition flat-screen TV, fridge/mini-bar, safe, individual climate control and complimentary bottled water replenished daily. The pair of Presidential Suites have a separate bedroom and living area. Additional perks for suite guests include butler service, daily snacks and fruit and an Italian coffee maker. Passengers in the Presidential Suites can additionally order room service. The onboard voltage is 220v, and all power points are of the continental two- or three-pin variety so U.S., U.K. and other non-mainland European passengers need to bring adapters. Meals are served at a single sitting in the main Globe restaurant and a la carte restaurant, the latter available exclusively to passengers in the Executive and Presidential suites. Other facilities include the library, a for-fee internet cafe, beauty salon, fitness center, cinema, card room and heated 2,153-square-foot indoor swimming pool. There is an onboard medical center and laundry service (both with fees) and the ship has two exterior scenic elevators. The large lounge, with 12-foot ceilings, hosts evening performances and guest lectures, along with classes in tai chi and the traditional Chinese board game mah-jongg. 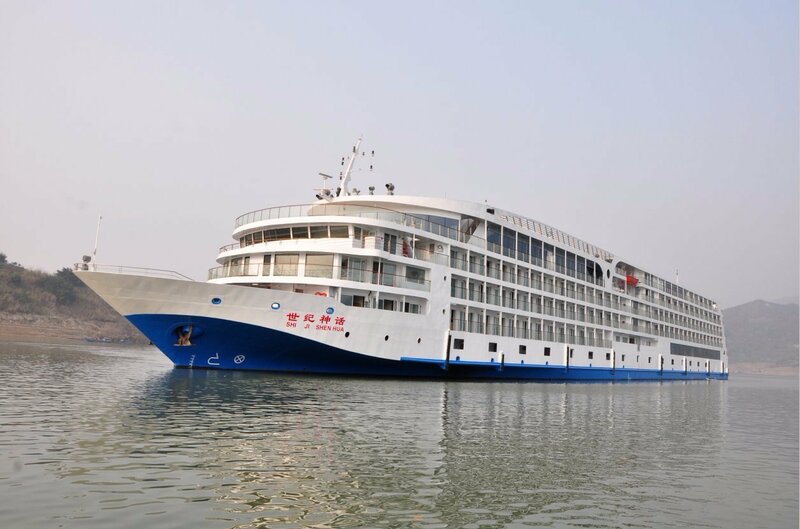 Century Paragon mainly sails on four-night upstream and three-night downstream itineraries between Chongqing and Yichang, including a transit of the Three Gorges Dam lock system and calls at Shibao Pagoda, the Three Gorges of the Daning River and the Three Gorges Dam. Additionally, there are seasonal winter itineraries, including a 10-night cruise from Chongqing to Shanghai.